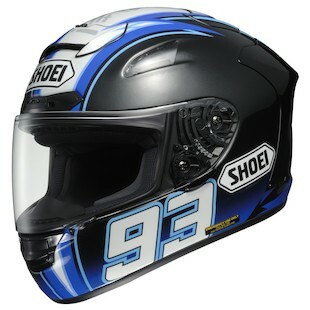 New Shoei X-12 Marquez Graphic! As one of your fans and admirers, I know that you are a man of the most discriminating taste, in life, in sport, in play, and in helmet selection. I wanted to write and inform you about a very special young man (perhaps you have heard of him) who is rapidly gaining his own reputation for an equally exquisite style, particularly in helmets, that I am sure you can appreciate. Further, this young man has recently been the subject of great media interest and is frequently being compared with your likeness, as such, I see it as my humble civic duty to inform you of the latest happenings. You see, my friend Marc (we’ve never met, but I’m sure that we would be best amigos) with his fun personality and killer racing style has recently been quite the sensation in MotoGP, which in some ways I’m sure makes you proud that another rider is picking up the B.A. torch that you left. And also, similar to you, Marq has gotten into the habit of releasing his own helmet graphics on his helmet of choice, the Shoei X-12 (or X-Spirit II as it is known in Europe). Personally, as one of your fans, I have always loved your helmets, but if I were to wear another one I think I would choose Marq’s latest creation. I mean just look at it, it is absolutely beautiful… it seems like it should have it’s own holiday or something. But seriously, this helmet is deserving of something cool (like a RevZilla blog post). It has all of the topshelf features that comes with a Shoei, like a Pinlock visor, an Emergency Quick Release and incredible venting. This particular graphic is called the “Montmelo” which is a tribute to the home of the MotoGP Catalunya Grand Prix, a place where he has enjoyed tremendous success, in fact, he actually wore this helmet at this year’s Catalunya Grand Prix. The graphic lightning bolt on the Shoei X-12 Montmelo Marquez Helmet acknowledges Marqi’s nickname “El Tro de Cervera” - The Thunder from Cervera. And like my mother always told me, lightning doesn’t strike twice, so these helmets are gonna go fast. If you are a #93 diehard, check out the Shoei X-12 Marquez Motegi, Shoei X-12 Marquez, and Shoei RF-1200 Marquez Black Ant Helmets as well!